Cupola - A small domed structure rising from a roof or tower. Curb - A molded or otherwise ornamented edging along the top of the lower slopes of a gambrel or mansard roof. Dentillated trim - A molding furnished with small rectangular blocks in a series, like teeth. Doric [Order] - The oldest and simplest of the classical orders, characterized by heavy fluted columns with no base, plain saucer-shaped capitals and a bold simple cornice. Dormer - A vertically set window on a sloping roof; also, the roofed structure housing such a window. Eclectic - Composed of elements selected or chosen from different sources. Elliptical - Shaped like a flattened circle. Entablature - In classical architecture, the part of a structure between the column capital and the roof or pediment; comprised of the architrave, frieze and cornice. Eyebrow window - A small window in an attic story. Façade - The outward architectural features of a house. 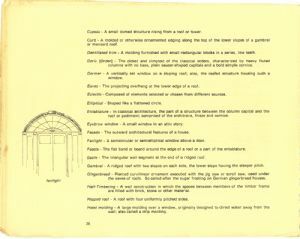 Fanlight - A semicircular or semielliptical window above a door. Fascia - The flat band or board around the edge of a roof or a part of the entablature. Gable - The triangular wall segment at the end of a ridged roof. Gambrel - A ridged roof with two slopes on each side, the lower slope having the steeper pitch. Gingerbread - Pierced curvilinear ornament executed with the jig saw or scroll saw, used under the eaves of roofs. So called after the sugar frosting on German gingerbread houses. Half-Timbering - A wall construction in which the spaces between members of the timber frame are filled with brick, stone or other material. Hipped roof - A roof with four uniformly pitched sides. Hood molding - A large molding over a window, originally designed to direct water away from the wall; also called a drip molding.